menocu: Verisimilitude? Probably in some movies but absolutely not this one. Verisimilitude would mean the characters might say something, anything at least marginally negative about the product in private brainstorming meetings. Mad Men does this with real products all the time. This movie just had them reciting Nike’s copy to each other verbatim. Product placement at its worst. Mac And Me is an apt comparison. 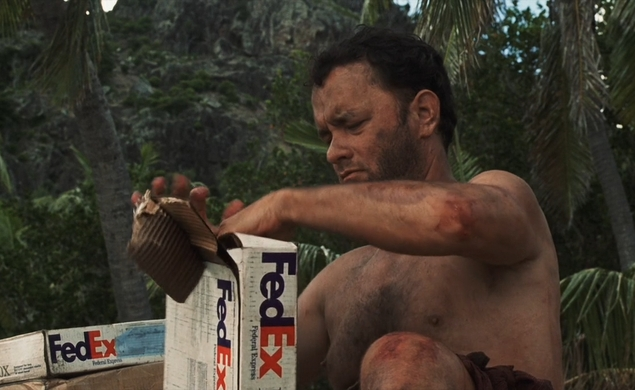 I want to tackle Cast Away first, because I’ve always considered that movie’s FedEx plug to be the platonic ideal of product placement—because to me, it does feel more real for Hanks’ character to work for FedEx than for some fictional shipper. If he worked for “GlobeEx” or “IPS,” I’d be thinking about what overnight delivery service it was supposed to be, which might be even more distracting. But then by and large, I see advantages in product placement, when done properly. If the producers strike a deal with McDonald’s because they want to use McDonald’s in a film, then that’s good, because we live in a world where people eat at McDonald’s, and movies set in this world should reflect that. If I had my way, I’d make “fair use” laws a lot looser—or at least would encourage artists of all kinds to challenge those laws more. No more blurring logos or giving corporations approval for how their products are used in movies. I want to go back to the days when a character could drink a Coke or eat a Zagnut bar and no one assumed that they’d been paid to do so. I remember watching the 1967 domestic comedy Divorce American Style a few years back and enjoying how the movie served as a time capsule of late 1960s suburbia: not just in the fashions and the architecture but in the cars, consumer products, and fast food restaurants, all of which are cited by name. The main problem with product-placement in both TV and movies is that it’s usually a case of people outside the creative team imposing their will on a production. I happened across Thor on FX last night and watched the big scene where Loki’s Destroyer terrorizes a New Mexico small town, during which a Dr. Pepper machine and a 7-11 sign are prominently displayed. In the abstract, there’s nothing wrong with this. Small towns have soda machines and convenience stores, so why not make them recognizable brands? It’s the way they’re shot in Thor that’s the problem. It’s highly unlikely that director Kenneth Branagh, acting independently, would’ve told his set designers, camera crew, and effects people, “Now really make sure the Dr. Pepper machine stands out in this shot.” In Thor, these clean, glowing logos have the same effect as one of those “bugs” that pops up in the corner of a TV screen to advertise what show is on next—which also happened several times while I was watching Thor. To bring it back around to What Women Want, my least favorite scene in that movie has always been the one where Mel Gibson’s character reads Helen Hunt’s character’s mind, and knows that she’s embarrassed to have been caught looking at his crotch. Except that he doesn’t need to read her mind to know that, because as Hunt plays it, she exaggeratedly winces and turns away, like a crazy person. The Nike product-placement in What Women Want is just as unsubtle. I understand that in today’s market, movie producers need to find creative ways to finance films, and I do like how the use of real products adds to the “cultural document” quality of films, in that it records some of what the world actually looked like at the time the movie was made. Just… be cool about it, okay, movie-makers? Don’t be Helen Hunt in What Women Want.